Of course no railway could run without signals � well � it could, but it'd only be safe to operate one train at a time which would rather defeat the purpose of a public transport system. So very early in the history of railways, signaling systems were invented. There's a wealth of publications on the topic, so, again, this isn't the place to go into all that. 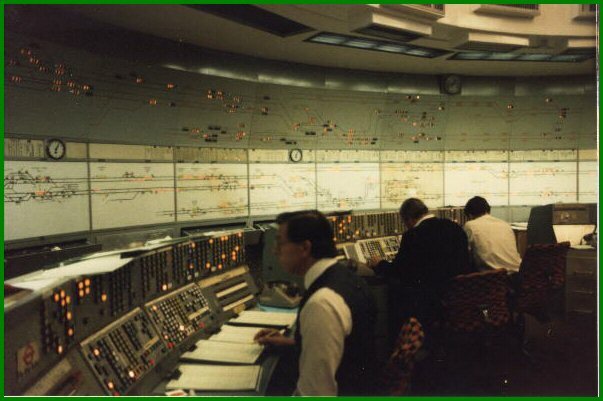 In connection with London Underground's system I'd urge you to go to Tubeprune and read his excellent explanations and descriptions on the technical workings of our signals, should you wish to gain more knowledge and understanding of these. Additionally (and since this page was first published) there is also an explanation and illustrations of London Underground signals and signaling systems here. But a brief description is appropriate to get a bit of a feel for what we have. London Underground signals fall into two categories � Automatic and Semi-Automatic. The latter equate to what are known as Controlled signals on the National Rail network. What's the difference? Actually quite a lot! Automatic signals are just that � they work by 'knowing' when the section they control is occupied. If it is they go to Danger (red). Once the section is clear they go to Clear (green). In common with everything on the railway the watchword is 'Failsafe', so if there is a technical breakdown and the signal can't 'see' its section, it goes to Danger � the signal has failed safe. All signals are identified by a unique number. In the case of automatic signals the letter 'A' indicates it as an automatic signal � this is followed by a three digit number unique to that signal. Semi-Automatic signals are controlled by a Signal Operator � either from a Signal Cabin or a Control Centre. There are also Programme Machines which can control some of these signals, so manual intervention isn't always required. 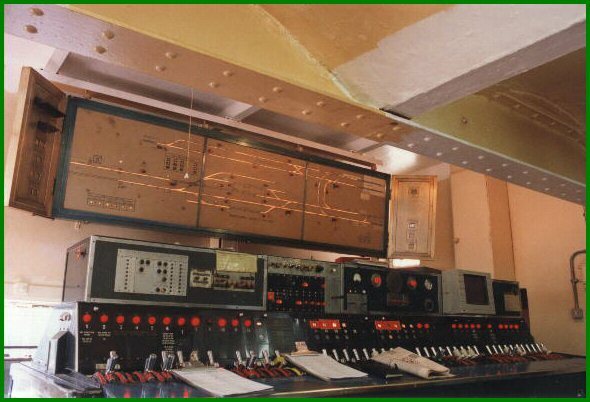 Programme machines are an early form of computer operated signaling system. As renewals take place these will be replaced with fully computerised systems, such as is used on the Central Line for example. 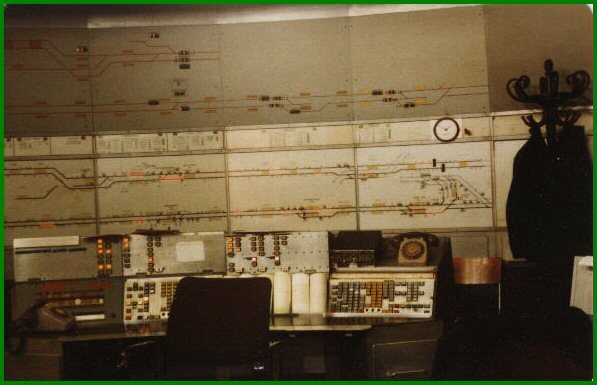 There the signals for the whole line are controlled from Wood Lane. Ours haven't yet reached this degree of sophistication, so our trains are signalled from a number of different locations. 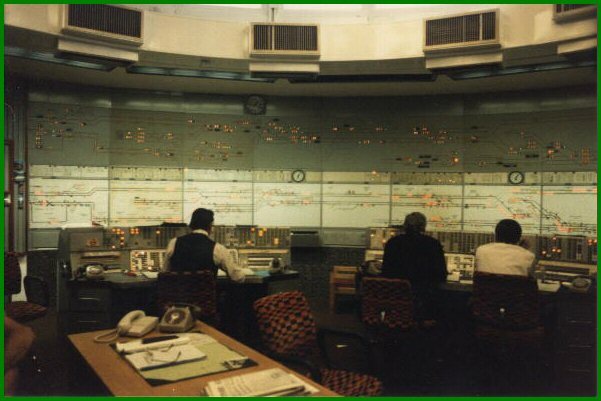 The largest of our signalling centres is located at Earls Court and this controls most of the semi-automatic signals west of Tower Hill � there are a few places it does not cover, but I'll expand on these later. Tower Hill desk. Controls Embankment, Mansion House and Tower Hill controlled areas. Desks 1 & 2 in view control the Piccadilly line from South Harrow and Heathrow through to Barons Court plus the District line from Ealing Broadway and Putney Bridge through to South Kensington. Desk far right also controls the single line to Kensington (Olympia). Signal numbers are again allocated. This time the signal plate will consist of two letters followed by anything up to three numbers. The letters are the 'Cabin Code' and the number relates to the lever number for that signal. Of course these codes have long since been replaced in reality by a far reduced number of actual cabins, but at each location there is an Interlocking Machine Room which locally controls the signals and points in its area. An IMR is really a remotely operated cabin, so it is still appropriate for the Cabin Codes to be retained. The area between Tower Hill and Aldgate East is controlled by the Control Centre at Baker Street � remember here we are in 'Metropolitan' territory � this is Minories Junction. Whitechapel has a signal cabin all to itself. Lever frame controls Whitechapel and St. Mary's Junction on District line, push buttons control Shoreditch, Whitechapel & Whitechapel Junction on East London Line. The area between Bromley-by-Bow and Dagenham East is controlled from the signal cabin at Barking. Note by District Dave - The reference in this caption to Dagenham Heathway is incorrect - the area controlled is from Dagenham East as stated later in the caption! Finally the Cabin at Upminster controls the area from Hornchurch to Upminster. I mentioned earlier that there are some exceptions to the signaling arrangements at the west end of the line. The first is the area from Notting Hill Gate to Edgware Road � the controlled signals in this area (which are between Paddington � Praed Street Junction and Edgware Road itself) are controlled from the cabin at Edgware Road � remember again here we're in MetLand! The other exceptions are from East Putney to Wimbledon and between Gunnersbury and Richmond. Here we are on Railtrack metals and not only are we subject to their Rules and Regulations but their signalling systems too, which have quite a few differences from London Underground's � so as District Line driver you have to know both! Earlier I described the failsafe nature of automatic signals. The same applies should a semi or a controlled signal fail � the signal will return to danger and the signal operator won't be able to clear it. In my diary pages you'll find a description of how this situation is addressed. There is often a great deal of misunderstanding between drivers and signal operators � the former thinks the latter is trying to delay him at all costs, the latter thinks the former is trying to bother him when there's a problem he's trying to resolve and is under pressure! Often the only time one speaks to the other is when the driver is delayed and uses the signalphone � the signaler is often under pressure and the driver often gets pretty short shrift! Personally I'd like to spend time with a signaler to understand his job better, and I think it'd do the signalers good to spend some time with drivers. Then perhaps we'd all understand each other a bit better! I touched earlier on the Control Centre at Earls Court. Not only does this control the signaling for the section of the line described, but is also where the line is run from � the Line Controllers are there, able to 'see' the line from the signaling diagrams and, at certain locations, via CCTV too. 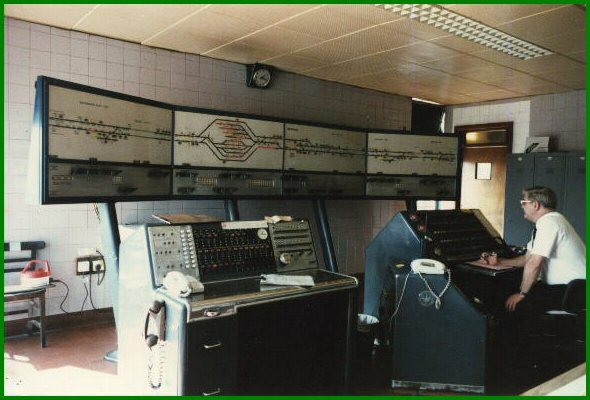 The Line Controller has the immediate responsibility for the service � he is the one who must react to any situation � perhaps suspending a service, diverting trains and so on � and he will send and receive messages by radio to the trains. He will also put into place any emergency procedures necessary in any given situation. Also at Earls Court is the Duty Operations Manager (DOM). It's the DOM's job to look overall at the service, and he is responsible for maximising the train service � that's a pretty simplistic explanation, but gives the right idea at least! 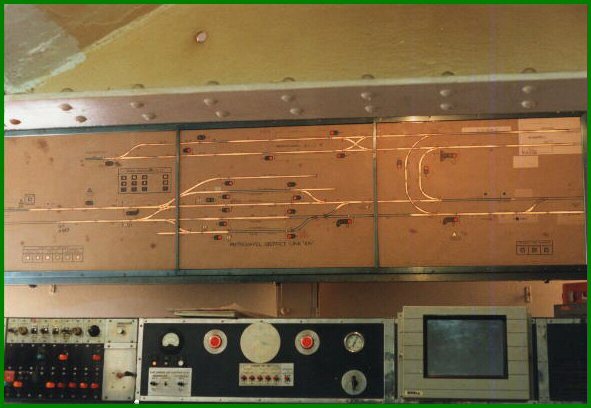 So there we have it � a brief view of the signalling structure of the District Line. With the exception of the photographs taken in Upminster Signal Cabin, which are my own work, all the photographs and captions which appear above have been reproduced from and are with the permission of Anorak Heaven. Although they were all taken some time ago, little has changed in any of the locations, so are quite relevant to today's operations. My thanks are extended for the use of these images.